Our education programs provide a variety of opportunities for volunteers to connect to the Missouri River. Do you have experience in education, non-profits, law, fundraising, or community organizing? Are you looking for a rewarding opportunity to use these skills in a way that gives back to students and educators? Experience- You will get to experience how things work inside MRR and see what all goes into making our education programs successful! Relationships/ Networking- Build stronger relationships with a wonderful community of knowledgeable professionals. You are guaranteed to make new friends! Brand Building- Not just participating, but becoming involved with MRR education programs will help you build your brand. After all, it is not about who you know…It is about who knows you. Development- The things that you will learn while participating in the committee will directly translate into professional and personal development. Service- Joining the committee gives you the opportunity to serve MRR education programs at a greater level and contribute to the growth and future success of MRR. If you are interested in applying to serve on the Education Advisory Committee? E-mail the Education Coordinator, Kristen Schulte for the detailed responsibilities and application. We combine place-based education and inquiry-based science for both formal and informal educators in our professional development programs. These programs include invitations for educators to practice new skills, collaborate with their peers, and apply learning to lesson plans. Set on the Missouri River, this workshop provides a hands-on experience through the Missouri River Curriculum giving educators the opportunity to apply Next Generation Science Standards' practices of science to their classrooms. Educators gain a new understanding and deepen their connection to the Missouri River which will provide them with the inspiration to connect their curriculum to the local watershed and other ecosystems in the places that their students live. Connect with the natural and cultural history of the Missouri River through adventure and investigation. Discover the river ecosystems and the natural forces that shaped them. Understand how human choices have affected the river’s rhythm and flow.Knowledgeable and experienced instructors will show educator how to use river education to integrate science, social studies, English language arts and math in a way that engages students and strengthens their learning. This four-day workshop, hosted on even number years, immerses educators working in the use of the Missouri river as a catalyst for learning. Educators gain important background knowledge and an introduction to Missouri River ecology and history while becoming Project WET certificated. This knowledge serves well when developing lessons and curriculum to incorporate river education in their student’s lives. 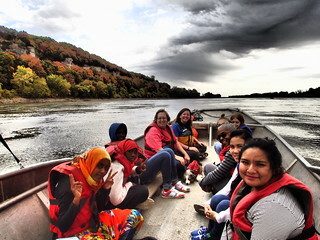 Bring your students to the Missouri River for a one of kind learning experience. As our programs engage students’ innate sense of wonder and natural curiosity to explore the Missouri River through place-based programs that are interdisciplinary in nature and experiential in character. Would you like Missouri River Relief to engage students during your event or festival? Then the recycle relay might be just what you are looking for! This presentation discusses the unique trash on the river while challenging youth to get active, work together and properly recycle. How long is the Missouri River? What states does it flow through? In this classroom presentation, students build their knowledge and understanding of the Missouri River while working in groups. Students also learn about the exciting work that Missouri River Relief is doing to clean up the river and how they have the opportunity to be involved, often we promote a nearby city-wide Missouri River Clean Up. Students leave their lab coats and pocket protectors behind; to do science, Missouri River Relief style. Students investigate the mysteries behind the longest river in North America and learn what makes it tick. The cottonwood forests, sandbars, and the river will be their laboratory. Students might get the chance to dissect a fish, investigate and describe the plants that live along the river or create a scientific journal full of sketches, research, and data they have collected. Students will also get to meet some of the scientists that study the river and learn how they are helping the river's ecosystem. Students divide into stewardship teams to learn through laughter, challenge, and making a difference on the Missouri River. They will spend half of their time developing teamwork skills through a variety of fun challenges and half of their time working together in service to the Missouri River. This service involves digging tires out of the muddy, picking up dozens of plastic bottles and finding unique river trash. Through these activities, the student will get to know one another, the Missouri River, and themselves much better. Bringing your students to the Missouri River is a one of kind learning experience, that every student should be afforded the opportunity. That is why Missouri River Relief created the Missouri River Days, this program is the “Investigating the Missouri River” on steroids! Its structure is designed so that an entire grade can experience the Missouri River. Every student dreams of being on an all-star team? In this after-school program, elementary students work in teams to develop and carry out their own investigation to understand the Missouri River better. They will practice real-world science techniques, with a Missouri River Relief twist, all while building their skills as a team player during an experience they won’t forget. On a mild fall morning, a group of nervous youth, one by one, loads onto a boat, they cruising in the boat down the river observing the movement of the water, the cottonwoods changing color and the stark contrast of the limestone bluffs. As the boat arrives at a bald eagle nest, a bald eagle swoops down on the river. The students erupt with excitement. “Whoa!” they say, elbowing each other. “Did you see that?” Moments like this are unforgettable for many youths. All aboard! It’s an excursion on the Missouri River, where every moment brings a new experience. Our custom excursions in Columbia, Missouri incorporate spectacular views of limestone bluffs, eagles' nests, and prehistoric artwork, as well as insider’s knowledge about the river imparted by our crew. These excursions are a unique tool for developing a deeper understanding of the river. 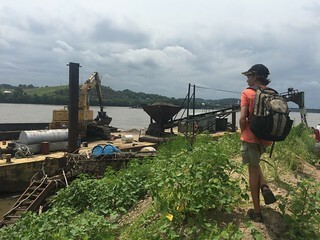 Can you imagine exploring the Missouri River by boat, connecting with the natural and cultural history of the Missouri river through adventure, exploration, and investigation? In the Academy, students discover the river ecosystems and the natural forces that shaped them. They learn how human choices have affected the river’s rhythm and flow. All while being guided by knowledgeable and experienced instructors that will give them the understanding, skills and confidence to enjoy, make use of and protect the Missouri River.